December 5, 2016 –To mark the holiday season, today Electrolux made an impactful monetary donation to the Mid-South Food Bank. Throughout the week, the company is making holiday donations in each of the U.S. communities in which it manufactures ranges, dishwashers, refrigerators, freezers and washer and dryer products under the Frigidaire family of brands and the Electrolux brand. In total, these donations amount to nearly $50,000. Electrolux donated $5,000 to help the Mid-South Food Bank fullfill its mission to support nonprofits that provide food to the needy free of charge, such as food pantries, soup kitchens and shelters. Within its service area, the organization reports, 23.7 percent of children are food insecure, defined as not always having enough food to meet basic needs. Electrolux is a global leader in home appliances and appliances for professional use, based on deep consumer insight. We offer thoughtfully designed, innovative and sustainable solutions, developed in close collaboration with professional users. The products include refrigerators, ovens, ranges, dishwashers, washing machines, vacuum cleaners, air conditioners and small domestic appliances. Under esteemed brands including Electrolux, AEG, Zanussi, Frigidaire and Electrolux Grand Cuisine, the Group sells more than 60 million products to customers in more than 150 markets every year. 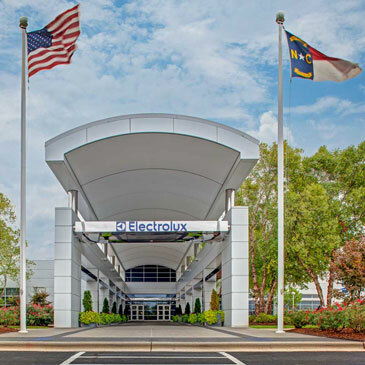 In 2015, Electrolux had sales of $14.7 billion ($5.1 billion in North America) and 58,000 employees. For more information go to www.electroluxgroup.com. Deutsche Bank and Electrolux Major Appliances - North America (EMA-NA), offered two one-day education events to introduce Financial Supply Chain solutions to EMA-NA suppliers. Twenty-three suppliers attended the event. Deutsche Bank and Electrolux Major Appliances - North America announce a program to extend Financial Supply Chain (FSC) solutions to EMA-NA suppliers.